After 7 years without attending at the Valencian fair, Dune returns with much desire and hope to Cevisama. A very special collection, Minimal Chic, has been devised. 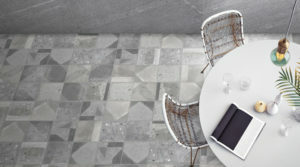 The principles of minimalist art are the pillar of this new collection, which has a touch of sensitivity in its designs. Frank Stella highlighted one of the most representative aspects of this artistic movement through the phrase: “What you see is what you see”, but Dune does not renounce to endow with certain soul and symbolism to its collection. The elementary geometry of the shapes and the neutral colours are the basis for the creation of the decorations. 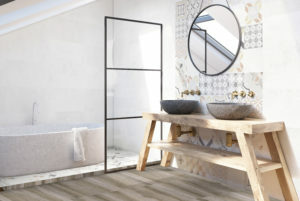 A collection composed of 2 series: Emporio, marbling finish, and Factory, cement finish, whose sizes range from 20×20 decorations through 30×60 wall tiles, and 60×60 and 60×120 floor tiles. The golden touches and baroque patterns so characteristic of Dune are the main abstractions in this collection that seeks harmony and simplicity for the creation of sophisticated but neutral environments.